It would be putting it lightly to say that cars have acquired a bad reputation, environmentally. On the one hand, we have the gas-guzzlers of the world; on the other hand, electric and hydrogen-powered concept cars seem to be stillborn, and energy-inefficient biofuels are damaging the earth in other ways. While automakers clamor to brand their products as green(ish), one car company claims it wants to change the paradigm. Forget improving gas mileage, Toyota has set itself a higher goal: to design a car that, according to the Guardian UK, "leaves the air as clean as it found it, avoids crashes and improves the health of those who drive it." Toyota made its name in the US selling small cars during the 1970s gas shortages. Having lapped GM last year to become the world's biggest automaker, the company seems to have cornered the hybrid market with its ubiquitous Prius, and has a new version on the way that can be recharged overnight from an ordinary electrical outlet. There are still improvements to be made: this version still uses a toxic battery, and carbon emissions savings depend on how the electricity is generated. And Toyota joined Chrysler, Ford, and GM this year in opposing a Senate energy bill that would have raised US mileage standards to less than EU standards. 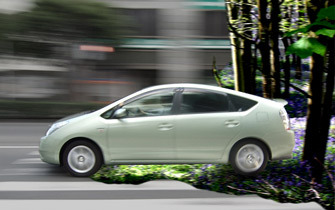 Yet Toyota president Katsuaki Watanabe declares his dedication to "sustainable mobility." Here's hoping he can make that a reality.